Chicken sausage, paired with a rich country gravy, crushed black peppercorn, folded in a flaky, buttermilk biscuit turnover. From frozen bake in a pre-heated 350 ºF convection oven for 20 - 22 minutes or until internal temperature reaches 165 ºF as measured by use of a thermometer. Based on the overwhelmingly positive reception of Kabobs’ Breakfast Buttermilk Biscuits, our team of culinary professionals have created a more portable breakfast sandwich, the Buttermilk Breakfast Turnover. 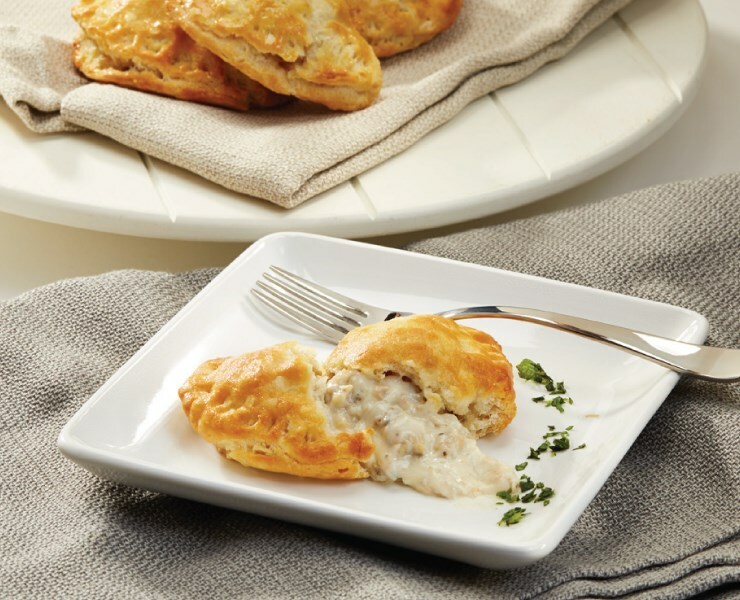 Crafted with the same mouthwatering buttermilk biscuit pastry, praised in our larger biscuits, the Buttermilk Breakfast Turnovers are stuffed with lightly folded eggs, savory cheeses, then folded into a crescent. Available in four varieties: Applewood Smoked Bacon, Sautéed Leeks & Wild Mushrooms, Latin Chorizo, and NEW Chicken Sausage & Gravy. Kabobs’ Artisan Breakfast Turnovers provide your guests with an excellent on-the-go breakfast or mid-morning break scenarios. Chocolate Tartlets, Choux Praline, Pistachio Squares, Tangerine Tartlets, Chocolate Eclairs, Coffee Eclairs, Raspberry Tartlets, Opera Squares, Lemon Tartlets. Chicken thigh meat, marinated in a Guajillo pepper mole sauce, paired with a slice of plantain and a fresh hand-sliced Poblano pepper. Slow roasted chicken, paired with Marsala wine, rich cream, fresh green onions, mushrooms and shallots, baked in a handcrafted buttery pie crust. Succulent farm-raised mini lobster meat is lightly marinated in a coconut batter, hand threaded on a 6" bamboo skewer, then rolled in coconut flakes. A fresh asparagus spear, accompanied with savory asiago cheese, hand wrapped in crisp buttery phyllo, and finished with a light dusting of kataifi.